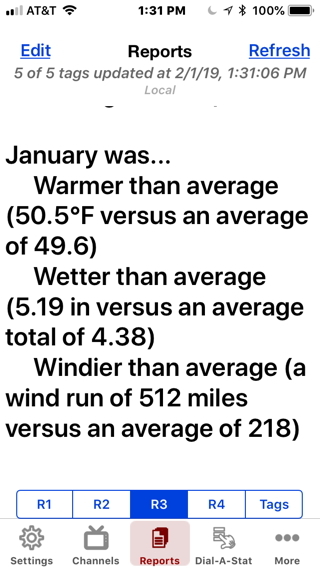 My results are consistent with December with the positive of more rain. When it did rain the storms were more extreme than in the past. So what did WeatherCat observe in your neck of the woods? So in general colder and more stormy than normal here in Northern California. Northern Utah looked like this. It is a bit interesting in that the temperature and wind are consistent with more storms. However, the rainfall is below what has happened in the past. The reason has been a few years in which there were some atmospheric river events in March. 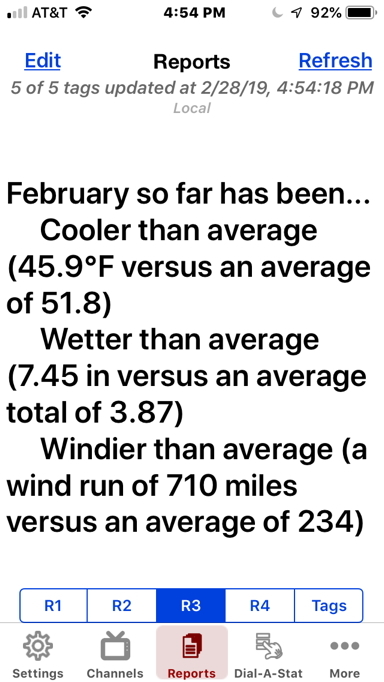 I only have 9 years of March data and in 3 of those years the station got over 10 inches of rain. So that skews the statistics. Of course, this is Maine and we received 4 inches of the white stuff yesterday in a lovely little Nor'easter.....this is after EVERYTHING had melted and I foolishly thought Spring (and MUD SEASON) had arrived. Ol' man winter is still hanging around the west coast of the United States as well. So you may be seeing snow for a while. 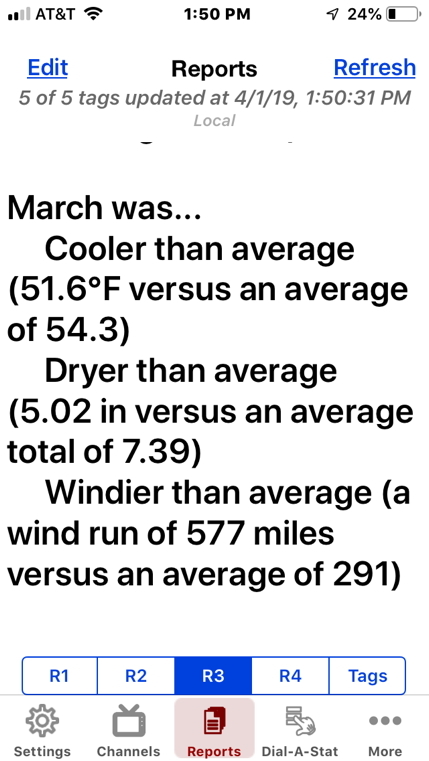 This past March was really cold for you compared to your averages. How long has your station been collecting data? I suppose you aren't counting snow in your precipitation totals and that's why the average rainfall is so small - correct? Certainly an interesting report - thanks for sharing. I didn't want Jennajon feeling bad about being the last one to the line this time, so here's my offering. I made it large enough that Steve could see it without getting out his magnifying glass. My excuse is that we just arrived home from a fabulous trip to New Zealand and Australia. They have weather there too. I made it large enough that Steve could see it without getting out his magnifying glass. Report to moderator: While true, user @Blicj11 is picking on me. Request a time-out behind the snowblower as punishment. Welcome back! I hope that you enjoyed your antipodal adventures! Dear Blick, Steve, and WeatherCat regulars,. . . . I was able to free my car from a snow berm last night with only 45 minutes of shoveling snow and ice. Hahaha. Welcome to Springtime in the Rockies. . . . . Is that close enough? . . . . .
My excuse is that we just arrived home from a fabulous trip to New Zealand and Australia.
. . . . . Well, we'll excuse you this time, but don't let it happen again! . . . . They have weather there too.
. . . . . No kiddin'!! I thought weather was only a manifestation of Western Imperialist Hegemony!! . . . .
Hahaha. You got me back because I had to look up antipodal.